Referees take centre ice this week on the HNIC Podcast. Why would they choose their line of work? When everything goes perfectly, and they do their job as well as it can be done, theoretically, they go unnoticed. That's the best scenario. On the flipside, a ref makes one little mistake at the wrong time, and everyone knows who they are — for all the wrong reasons. A glimpse into the day-to-day life of the guys in stripes: long stretches away from family, having their work evaluated on a nightly basis by bosses and fans, and of course managing and dealing with loud, angry personalities. 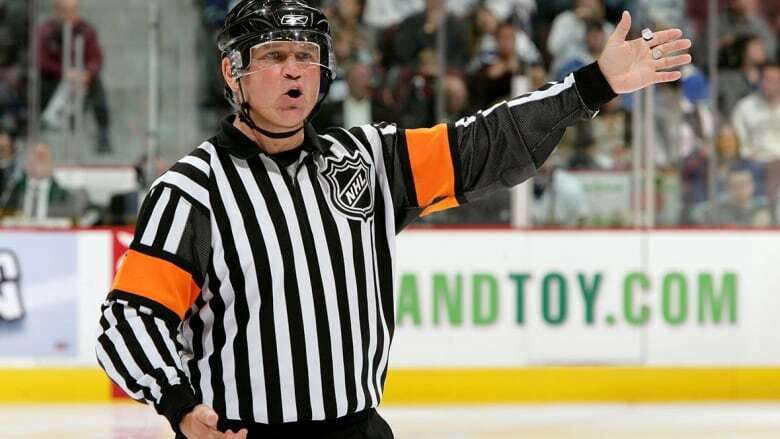 How has the role of an NHL referee changed? New rules, video replay, the addition of a second referee, and no more names on their backs...what has that all done to the game? Don Koharski officiated over 1,700 regular-season games, as well as the 1987 Canada Cup. Koharski and host Rob Pizzo discuss the 30th anniversary of the infamous "donut incident." Stephen Walkom, vice president and director of officiating for the National Hockey League, offers his unique and authoritative perspective on officiating. Sophia Jurksztowicz gets on the line with NHL referee Garrett Rank. Her weekly ice level feature turns to Rank's remarkable story...his successful fight against cancer, his love of golf —and incredibly -his competing in the U.S Open.